The Justice Department defines money laundering as the process criminals use to conceal and disguise illicit proceeds—converting unlawful money and criminal profits into legitimate goods and services—giving them legitimacy and economic power. Infusing illegal profits into the nation’s stream of commerce corrupts “not” only financial institutions, but the nation’s money supply and, ultimately, the country’s democratic system of government—giving criminals unchecked influence. 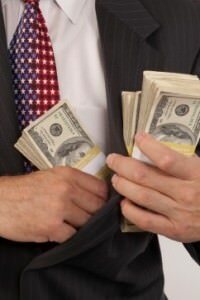 Accordingly, members whose background also includes FBI Money Laundering can be a great asset to someone looking for an investigator and/or needing an expert concerning concealing money and financial assets. Historically speaking, the FBI has utilized a proactive approach pursuing money laundering violations using the asset forfeiture statute to seize illicit profits converted into legitimate goods and services. Predicating these investigations, agents must first identify the unlawful activity involved generating the illicit proceeds, making sure a crime is covered by the statute, and once satisfied, a parallel financial investigation can be opened to locate and seize the illegal proceeds. Recognizing illicit proceeds are a continuing and growing problem in the nation’s economy, the FBI has created the Asset Forfeiture/Money Laundering Unit (AF/MLU) to identify, target, disrupt, and dismantle criminal and terrorist organizations and individuals engaged in money laundering schemes. The unit proactively encourages agents to use the statute whenever investigators suspect money laundering involving a known criminal enterprise. Additionally, the Justice Department also sponsors the Money Laundering National SAR Review Initiative responsible for targeting schemes that transcend national borders using multi-agency approaches and resources to consider cases for investigation/prosecution. Using the Asset Forfeiture/Money Laundering Unit to seize illicit proceeds, law enforcement officials are convinced the statute takes the profit out of crime—deterring future criminal activity. And as another benefit of the program, recovered property can also be used to compensate victims, as well as shared with state and local law enforcement agencies to help alleviate funding problems. Through FY 2011, the FBI said agents and analysts investigated 303 cases involving Money Laundering violations returning 37 indictments, securing 45 convictions, $18.4 million in restitution, $809,414 in recoveries, and $983,536 in fines. Members’ listing FBI Money Laundering as a skillset can be very helpful to law firms, security professionals and journalists, needing an investigator and/or expert, wanting information about concealing money and hiding assets, need a professional opinion and/or want someone to provide media commentary. Asked to review evidence reflecting concealed financial assets, members whose skills include FBI Money Laundering can analyze digital evidence, provide courtroom or deposition testimony, and/or when solicited, produce an affidavit documenting assets and transactions. Besides having an expertise concerning FBI Money Laundering, these members also have important organizational, analytical and reporting skills, necessary to examine and present evidence and/or interview witnesses. Worried about security, learning about concealed assets and hidden money, members listing FBI Money Laundering can provide valuable insight and guidance laying out a security plan. Specifying FBI Money Laundering as a skillset, these members also have the training, expertise and contacts to analyze monetary transactions involving commercial and private interests, “not” only at the federal level, but state and local level as well. Likewise, many members whose backgrounds include FBI Money Laundering also have media experience, and can provide journalists and news outlets with media commentary and/or case analysis presented with complicated financial transactions involving concealed assets. Able to cite policy manuals and regulations, presented with a criminal complaint and/or an indictment, members listing FBI Money Laundering can provide viewers and listeners with color and background information. Need additional information about a member whose background includes FBI Money Laundering just make contact with the member and make inquiry. Looking for an FBI Money Laundering—website visitors need only use the search feature, entering the appropriate skill, as well as the geographical area of preference and make contact with an FBI Money Laundering using the information provided. Retired FBI Agents and Analysts, interested in securing a Directory listing and/or a personal email address who have a background that includes FBI Money Laundering, need only submit a brief online application to join the website.